We can produce any custom sheet metal part you need. Simply provide us with the dimensioned drawing of what you need and we will have it ready for you quicker than you thought was possible. We also provide an engineering service if you need help with the design and dimensioning. 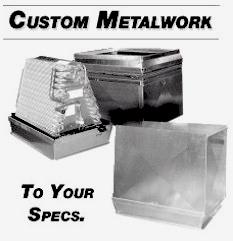 Wholesale and retail sales of custom and standard sheet metal products and ductwork fittings for customers in Clinton Township MI 48035 48036 48038, Eastpointe MI 48021, Fraser MI 48026, Center Line MI 48015, Chesterfield Township MI 48047, Harrison Township MI 48045, Macomb Township MI 48044, Mount Clemens MI 48043 48051, New Baltimore MI 48047, Roseville MI 48066, St. Clair Shores MI 48080 48081 48082, Shelby Township MI 48316, Sterling Heights MI 48310 48312 48313 48314 48315, Utica MI , Warren MI 48088 48089 48092 48093, Grosse Pointe MI 48230, Grosse Pointe Shores MI 48230, Grosse Pointe Woods MI 48236, Harper Woods MI 48224 48225, Center Line 48015, Chesterfield 48047, Chesterfield 48051, Clinton Township 48036, Clinton Township 48038, Clinton Twp. 48035, Clinton Township 48035, Clinton Twp. 48036, Clinton Twp. 48038, East Detroit 48021, Eastpointe 48021, Fraser 48026, Grosse Pointe 48230, Grosse Pointe Park 48225- 48214, Grosse Pointe Woods 48230, Grosse Pointe Shores 48230, Harper Woods 48224 -48225, Harrison Township 48045, Harrison Twp. 48045, Macomb Twp. 48042, Macomb Township 48044, Mt. Clemens 48043, Mount Clemens 48046, New Baltimore 48047, New Baltimore 48065, New Haven 48048 -48050, Roseville 48066, Saint Clair Shores 48080, Saint Clair Shores 48081, Saint Clair Shores 48082, Selfridge 48045, Selfridge ANGB 48045, Shelby Township 48315, Shelby Township 48316, Shelby Township 48317, Shelby Township 48318, Shelby Twp. 48315, Shelby Twp 48316, Shelby Twp 48317, Shelby Twp 48318, S.C.S. 48080, SCS 48081, St Clair Shrs. 48082, St. Clr Shores 48080, St Clr Shores 48081, St Clr Shores 48082, Sterling Heights 48310, Sterling Heights 48311, Sterling Heights 48312, Sterling Heights 48313, Sterling Heights 48314, Sterling Hts. 48310, Sterling Hts 48311, Sterling Hts. 48312, Sterling Hts. 48313, Sterling Hts. 48314, Utica 48315, Utica 48316, Utica 48317, Utica 48318, Warren 48088, Warren 48089, Warren 48090, Warren 48091, Warren 48092, Warren 48093, Macomb county, Wayne county, and Oakland county.